About a year ago, a respected silver dealer, with whom I have done a fair amount of business, let me know that a pair of "long tongs" was part of their incoming inventory. As a collector of silver tea tongs, which the dealer and I had just been discussing, I expressed an interest in seeing photos and a description, once the tongs were actually in stock. When the tongs arrived, they were properly described, not as "long tongs" (which I assumed would be long tea tongs based on the fact we were discussing tea tongs at the time), but as serving tongs. Not having any in my current collection, I was intrigued at the possibility of acquiring a new pair. Shortly thereafter, I received a photo of the tongs, diagonal on a white background, marked as "incoming", with a note that this preliminary photo would be followed by a full description and the dealer's own photographs, once the tongs arrived. The photo with the green background is the first of a series of photos taken by the dealer and later forwarded to me. The dealer's description was for a: "Rare Pair of George I Silver Serving Tongs, Samuel Hitchcock, London, 1720. Of heavy gauge silver and scissor form, the elongated rectangular shafts with interior ribbed grips below a crested central pivot surmounted by elegantly scrolled handles and graduated rings for the thumb, and the middle and ring fingers . . .H•I above a fleur de lis (a spot below visible in only one mark) thrice, (Grimwade # 1016) and lion passant on finger rings. (The mark of SH registered in 1720 (Grimwade #2526), along with the return to .925 sterling and lion passant. Condition: Excellent; without breaks or repairs. For a similar but later George III example (listed as John Harmer, London c. 1760) see Christie's Important Silver, King Street, 2008, Sale 7597, Lot 19 . . . ". So, curious to see the c. 1760 pair and compare it with the 1720 pair being offered, I located the Christie's auction results, description, and photos online. The Christie's pair is the pair in the photo with the clear background. As you must be, after viewing both photos, I was surprised to see, not a similar pair, but rather an identical pair, except for the crest. Both pairs are identical in style and construction. Both pairs are 10 5/8 inches. The weight difference was only .03 ounce (.85 gram). The only variations were two areas that appeared ever so slightly thicker on one pair as opposed to the other. Those slight differences will be mentioned later in this article. Now that my curiosity was really peaked, I began a google image search for other identical pairs of tongs. Other than the Christie's pair, and the pair this dealer was offering, I found only one other example online. This pair was from a recent auction. The photo was an exact match to the preliminary photo (of the tongs diagonal on white background) sent by the dealer, marked "incoming." The auction description was for "silver wishbone sugar tongs", no date, no maker listed, and of course the auction description was incorrect. Although the dealer wouldn't confirm that this pair was in fact the pair they had just purchased, I feel certain that it was, due to the matched photos. So now I was back to the two pairs with which I began. Two pairs, attributed to two different makers, with a forty year difference to boot. I just didn't think this was possible. And so I began an email dialogue with the dealer. Dear Dealer, I am never satisfied just collecting. I always want and need to understand what I'm seeing. I want to be an educated collector, as it enhances my appreciation of the items, and hopefully will help me gain the respect of fellow collectors. That being said, first, please be assured that I don't want to offend you, but I do need to ask some questions this time. Please let me note a couple observations and questions they raise about the tongs. I looked at the Christie's listing and checked the photo against the photos of your tongs. The tongs appear to be pretty identical in style, form and construction. The minor differences include the slightly thicker ridge connecting the scrolls to the hinge on your pair and a slightly more pronounced "hip bone" on your pair, just below the hinge. Given the 40 year difference, I question the fact that there is almost no variation in the style of design of these two tongs. I know the style/construction of the finger rings, arms and hinge changed dramatically on tea tongs between 1720 and 1760 and I wondered why the serving tongs would not have also changed dramatically in that time, mimicking the fashion of the day. For instance, tea tongs of the 1720s had fairly straight arms, with scrolls not coming into fashion until the 1740s. Further, the hinge is of a style that was not in use on early tea tongs of the 1720s era. 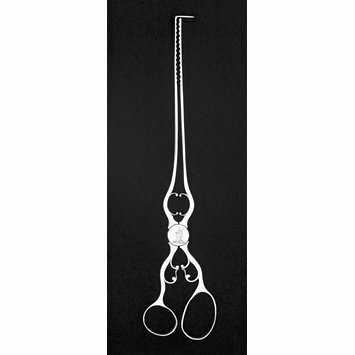 I also note that the length of the Christie's tongs is identical to your pair and the weight differs by only .03 ounce. Finally, I looked at the marks for Harmar (Christie's lists the maker as John Harmer, but Grimwade only lists a James Harmar who entered his mark in 1761 (mark 1374)). Like Samuel Hitchcock's mark (1016), Harmar's mark also has an H and I in a shield. Although the letters are reversed (Hitchcock is HI and Harmar is IH), the shields are also reversed (the point of the shield is on the bottom of Hitchcock's mark and on the top of the Harmar mark). Because the H and the I both look the same upside down as right side up, and the shields run the opposite way, except for the existence of a pellet or star, it would be impossible to tell the two marks apart unless the punch was extremely clean, clearly showing a pellet. All my observations having been noted, do you have a photo of the marks, particularly the one showing the star? Also, any thoughts on these observations? Is it possible that these tongs were also made by Harmar? I am at a disadvantage not seeing the marks. You may clearly be seeing the pellet so you may be certain of the maker. I just question some of the style and construction issues as not being that early. Hope I am not offending you with my questions. I am very interested in the tongs, regardless of the maker, but do want to be knowledgeable. Thanks. Good questions all. I had the same. The attribution was by someone I respect a great deal, and a previous head of Bonham's New Bond Silver Department. As there seems to be no John Harmer, and yes there is a James Harmar - one reference shows him registering about 1748, but another in 1761 - that mark not having a lobed punch but one with a distinct center point - I did not follow the Christie's lead - even if they stated it. There was also a John Hill - that didn't fit what I was seeing. These I's and H's are always a little up for grabs. I am at home today with workmen putting in a new floor, but will slip into the shop at lunch and get Grimwade and see if I have larger images that will show the pellet and a bit of the shape below - which could be a shape above too. Never apologize for asking. That is what makes us all learn. Thanks for your reply. It will be interesting to see a picture of the marks. Dr. Shlosberg's book says that no two pairs of tea tongs were the same if done by different makers, and that even matching tongs by the same maker are rare. The fact that tongs were often individually designed, coupled with stylistic elements that are more similar to the mid century tongs, rather than the 1720s tongs, makes me wonder if these serving tongs might have been done by the same maker (i.e. Harmer). And of course there is the possibility that if your marks are that of Hitchcock, Christie's tongs could also have been Hitchcock tongs misidentified as Harmar. Since I can't see the marks on their tongs, I will still wonder if they aren't both by the same maker. Keep me posted and please keep them on reserve while we look at this further. I agree that the shields are shaped differently. On a precisely stamped piece, with crisp marks showing the entire edge/outline of the shield, and showing any pellet, it would be very easy to tell. But I do agree that there is the possibility that the one mark that appears to show the pellet could be an irregularity, since the other 2 marks don't show it. If the stylistic elements were those of 1720, or if the two pairs weren't so much identical, I wouldn't question it. The style just doesn't jive with the date in my mind and the fact that both makers use an H and an I makes it highly likely that one pair is misidentified. I wish I could get my hands on the other pair for comparison! There seem to be two smiths by the name of James Harmar. The one from 1761 was described in Grimwade as a "bucklemaker" - highly unlikely as the smith for these rather sophisticated and elaborate tongs. Heal has another record of a Harmar, silversmith, 1747. But no mark is given. No other London IH or HI marks qualify in Grimwade for the lobed punch with either arrangement of initials. I have looked through all sections, including Provincial and other chapters. I have further completed my sojourn through all of the possibilities in provincial England for HI or IH in the proper punches - none to be found. The only book I didn't reference was Kent's West Country - but that is more on 17th century spoons anyway. In Grimwade, #1016 is still the most similar. The mark on the finger ring with the lion passant shows a definite serration to the top edge - however, that could also be a mis-strike. It was further suggested by my trusted associate that these tongs could date as late as 1730 by Hitchcock. I also just read the annotation that the Britannia standard of the two first initials were used alongside the 1720 return to the old standard of first and surname initials until 1739, at which time the old plates were required to be destroyed, as they were causing confusion - HELLO!! I had not been aware of the 1739 dating for the end of the first two letters - thinking it in 1720. Hitchcock worked until 1743. However, the lion passant from May 27-May 29 has a face more in profile, and corresponds to later GII marks. So maybe this overlapping of mark forms is the answer, and for the other tongs marked as Harmar as well. Not having seen the mark on the other tongs, there is no real way for me to attribute or dis-attribute. Now - you must remember that we are not talking about tea tongs. These are more for chops and vegetables. Their weight is remarkable - nothing delicate here. And S and C-scrolls have been a standard device throughout the late baroque period - which includes even the latter part of the 17th century through Queen Anne and George I. They are not a GII rococo introduction -- although it was in the rococo period that they became more complex, even more linear and more fragile -"Fragonard" depicts that rococo image very well. Also remember the scrolled handles on early bleeding bowls. But all that said, there is no way to ascertain an exact date to this pair - albeit between 1720 and 1739, minus 1727-29, given that the Hitchcock attribution is indeed the correct attribution. Thank God you have F in your name. An F is an F - always - unless someone thinks it should be an E - or maybe a T with a mis-strike! This is as much I can ferret out. And now I am more than sufficiently intrigued to the point where I must actually see the tongs. I do understand that, although at auction they were described as tea tongs, they were as you described, serving tongs. I had a nice pair of asparagus tongs identical to a pair at Williamsburg and in a moment of insanity, I sold them to some dear friends of mine. In any case, these serving tongs will be a better replacement and I look forward to receiving them . . . I will have my jeweler's loop ready, my books by my side, and of course a cup of tea. Thanks for all your information and research. I well know how that goes. I amended the online description to 1720-30, as was suggested to me. They were not sold as tea tongs, but serving tongs. I am delighted that you are intrigued. It matters not who, but what here. They are stupendous, rare, actually useful - you will see. The quality is top flight - better than any tea tongs I have even encountered, or asparagus for that matter. I am curious that there were not more made. I looked long and hard before chunking down the wad I did on these. There is very little profit - just to have them. But it was one of those things that now you have fallen prey to - beauty, quality, rarity, et al. I will pack and send on Wednesday . . . Thanks for your wonderful questions. I thoroughly enjoyed the search and kind-of answers. The tongs arrived safely, and are spectacular, regardless of when they were made, or by whom. However, as the very first email of this article stated, I want to be an educated collector. I distinguish that from what I call the "decorator collector," those who collect things that look nice and will fill a particular spot in their home. So after letting some time lapse, I took up my research again. First, I looked for sources about the origin of serving tongs. Samuel Pepys recorded one hundred pairs of "Sparrowgrass tongs" in the 17th century, but no known examples survive. The earliest extant pairs date to c. 1745 and were scissor like, rarely over a 1/2 wide with ribs inside one or both arms. They were similar in size to tailor's shears (Collector's Dictionary of the Silver and Gold of Great Britain and North America, Michael Clayton, World Publishing, NY, 1971, p. 350). Pickford, (Silver Flatware English, Irish and Scottish 1660-1980, Ian Pickford, Antique Collectors Club, Baron Publishing, Suffolk,1983 p. 178), however, said they didn't come into existence until the mid 18th century. Despite all of the emailed explanations from the dealer, I just couldn't get past the great dissimilarity between these serving tongs and tea tongs of the 1720 period. So, operating under the assumption that they are mid 18th century serving tongs made by James Harmar, there was still the question of which James Harmar. I decided to pick up where the last email left off: Who was more likely to have made serving tongs in general, a large worker or a buckle maker? Could or would a buckle maker make things beside buckles? If so, what else did 18th century buckle makers commonly make? How skilled were buckle makers? Were they artists or just tradespeople? That research is where I finally came to my own conclusions about the tongs. First, I found a very helpful article entitled, "Sir Edward Thomason; Silversmith, Inventor & Captain of Industry," Trevor Downes, Online Encyclopedia of Silver Marks, Hallmarks & Makers' Marks, the entire contents of which can be found at www.925-1000.com/ a_Thomason.html. According to the article, during the 18th century, Birmingham "was like a huge factory and the world was its customer. Manufacturing was the chief business, with buckle making alone estimated to employ an incredible five thousand workers. Men, women and children made them, and men, women and children wore them, everybody from the king to the farm laborer, and Birmingham satisfied that demand, turning them out by the million." That was my first clue. I had thought about the simple rectangular buckles worn on the everyday shoe of the 18th century, but the buckles of kings? What did they look like? Wouldn't it take more skill than a child could muster to make buckles fit for a king? If you were the buckle maker to the King, wouldn't that require some real skill and a great sense of design? Wouldn't there also be levels of quality in between the buckles of kings and those of the farm laborer? Wouldn't it take some skill to make those buckles? The article went on to discuss the transformation of Matthew Boulton's manufacturing at Soho, in Birmingham, when it passed to the young entrepreneur, Edward Thomason, after Boulton's death in 1809. Like Boulton, Thomason's father was a buckle maker. "[H]is output was prolific making 1,000 pairs a day, six days a week during busy times." The younger Thomason was "articled" to Boulton at the age of sixteen. By the time he took over his father's factory in 1793, "inspired by his time with Matthew Boulton, he was full of ideas and was a human dynamo. He started at first making gilt and plated buttons of the finest quality and then gold jewelry, this was followed by the striking of gold, silver and bronze tokens and medals, and silver toys, watch chains, buckles . . .etc. and in a very short time [he] increased the sales space to an amazing twelve showrooms. "Noting that the young Thomason was only sixteen when he went to work for Boulton, it stands to reason that he learned the technique, for making more than just buckles, in Boulton's shop. The fact that he was making "buttons of the finest quality and then gold jewelry, " would certainly support a conclusion that buckle makers could make a variety of highly stylized small objects, but would they make tongs? By 1796, Thomason was heavily involved with inventions, beginning with an unmanned fireship, followed by a wind powered water pump in 1797, and retractable carriage steps in 1799, but his greatest accomplishment was an improvement to the corkscrew, which he patented in 1802. "The next fourteen years saw his factory turn out 130,000 units before allowing others to manufacture under license and the design is still to this day considered by many to be the finest corkscrew ever made. Perhaps Thomason knew this as each one carried the motto "Ne Plus Ultra" (None Better). Production at the manufactory continued at an amazing rate, turning out silver spoons, sugar tongs, wine labels, jewelry, etc." What was that? Back up a few words please. Did someone say tongs? Yes, tongs. If this article doesn't give you a new impression of buckle makers, I don't know what would. Apparently, at least this buckle maker, and most likely Boulton, who trained Thomason, were skilled at the manufacturing of a variety of small silver objects. So what about other buckle makers of the 18th century? My search led me to a 96 page thesis entitled, "The Gold Rock: 17th and 18th Century Metal Buckles from Orange Bay, Eustatius" Bachelor Thesis by Ruud Stelten, Leiden University, Faculty of Archaeology, Leiden, April 2009, which can be found in its entirety at www.academia.edu/417766/The_Golden_Rock_seventeenth_and_eighteenth _century_metal_buckles_from_Orange_Bay_Eustatius. Stelten states that " [t]he earliest shoe buckles date to the beginning of the latter half of the seventeenth century. The first ones were purely functional and not much to look at. They sometimes formed the center of a lace bow and were set high up on the shoe. They were shaped like a bean and sometimes made of silver or bronze. Twenty-five years after their first appearance this type faded out of fashion. From the late seventeenth until the end of the eighteenth century shoe buckles came to be regarded as articles of high fashion" (The Gold Rock, Stelten, 2009, Leiden, p. 17). In 1720, it became the fashion to have, not only elegant shoe buckles, but matching knee and breech buckles as well. (Ibid). Stelten is aware of only one single piece buckle in the extensive St. Eustatius collection, the rest being made in two parts. The two piece shoe buckles can be divided into two categories: those dating to the period 1660-1720 and those dating to the period between 1720-1800. In both periods they were regarded as highly fashionable jewelry. A person's status could be judged by a swift glance at his or her feet. There were even buckles for special occasions, such as the mourning buckle which was worn when attending a funeral. Buckles dating to the first period (1660-1720), known in England as Jacobean shoe buckles, are usually relatively small (less than 45 mm long) and have asymmetrical, subannular, trapezoidal or rectangular frames. Concave sides are typical for the latter half of this period . . . The decoration predominantly consists of moulded extensions, knobs and surface ornaments like shell and flower motifs . . . the frames were accompanied by stud, anchor and cooking pot shaped chapes with a single tongue (Ibid p. 18). . .
. . . After 1700 these types of frames were slowly replaced by rectangular and subrectangular ones, known in England as Georgian shoe buckles. [As we heard in the article about Boulton and Thomason], by the 1720XXXs shoe buckles were, except for the very poor, in use amongst all social classes. They were worn by men, women and children (Ibid). The shoe buckles dating to the second period (1720-1800) are usually larger than the ones from the period before, averaging a length of 65 mm by the 1760's and reaching lengths up to 100 mm or more towards the end of the century. This was a result of a new fashion trend which was started by the French ambassador to England, the Comte d'Artois (later King Charles X), who in 1777 introduced large and highly curved shoe buckles . . .Moulded ornaments and engravings were the most common forms of decoration in this period, with a vast array of decorative elements such as rosettes, openwork, grooves, rope patterns and twisted ribbons . . . (Ibid p. 19). The buckles were cast in moulds after which they were finished by hand tooling. This resulted in standardization of forms, but as the Statian collection will show, the variation in decorative features reflecting the skill and style of the individual craftsmen is virtually endless. From the mid-eighteenth century onwards however, buckle makers developed increasingly elaborate casting techniques in which the decoration was made as part of the buckle. The center of the buckle industry was Birmingham. Due to the inventions of a stamping machine that enabled buckles to be pressed from prepared dies, Birmingham produced 2.5 million pairs of buckles per year in the late eighteenth century. There were around 30,000 people working in the English buckle trade at this time (Ibid p. 20). I should add here, that according to Dr. David Shlosberg, author of 18th Century Silver Tea Tongs, Deanprint Ltd, Cheshire, 2004, there are no known pairs of tea tongs produced in Birmingham, prior to the 19th century (Shlosberg p.73) I cannot say whether serving tongs were produced there before 1800. But I shall leave you in Birmingham nonetheless, picking sparrowgrass out of your shoe buckles, and pondering this topic for your own conclusions. While you're thinking it over, I should tell you that I found another somewhat similar pair of serving tongs online today, in the Victoria and Albert Museum Collection. You can find them following the link at http://collections.vam.ac.uk/item/O104094/asparagus-tongs-harmer-james/ . Although the style is not the same as our subject pair, you can note the similarity of style and workmanship, and the fact that the length and weight are nearly the same as well. The V & A description lists the date as c. 1765 and the maker as "James Harmar (possibly, maker). " Whether it was Harmar or someone else, I feel certain that the circa 1760-65 date is correct and that all three tongs were made by the same person. I am also completely convinced that a buckle maker was, in many instances, a highly trained artisan who could be quite capable of making highly stylized and fashionable objects, which might include tongs, if the shop was so equipped. Whether or not James Harmar of London is my man, I cannot say for sure. Perhaps there's a buckle maker in Birmingham with an IH or HI mark we have yet to uncover.